It’s hard to be a big fan of nettles; if they’re not taking over your garden, they’re stinging your ankles. But there’s no denying that they’re good for you, packed as they are with vitamins and minerals. In fact, if you believe the herbalists, the nasty nettle can do everything from purify the blood to cure arthritis, increase a nursing mother’s supply of milk and prevent dental plaque. And they’re undeniably trendy these days, packing out the Sunday supplements with recipes for soup, flans and pasta. My only experience with nettles previously had been of the ankle-stinging variety but I kept reading about how the sweetness of the nettle goes perfectly with blue cheese and so the evil-looking green patches at the edge of my local common seemed an opportunity too good to miss. Spring is the best time to pick nettles when the leaves are young and tender but provided you only go for the young plants, you can gather them at any time of year. Oh – and unless you are an idiot like me, take scissors and gloves on your foraging trip. These drop scones are quick and easy to make and the blue cheese does go well with the nettles. What with it being my first nettle experiment, I was a bit stingy with the quantity of nettle tops (stingy – geddit?!) and the result was a slightly herbaceous taste behind the hit of the blue cheese. Die-hard nettle fans might want to increase the quantity in the recipe. 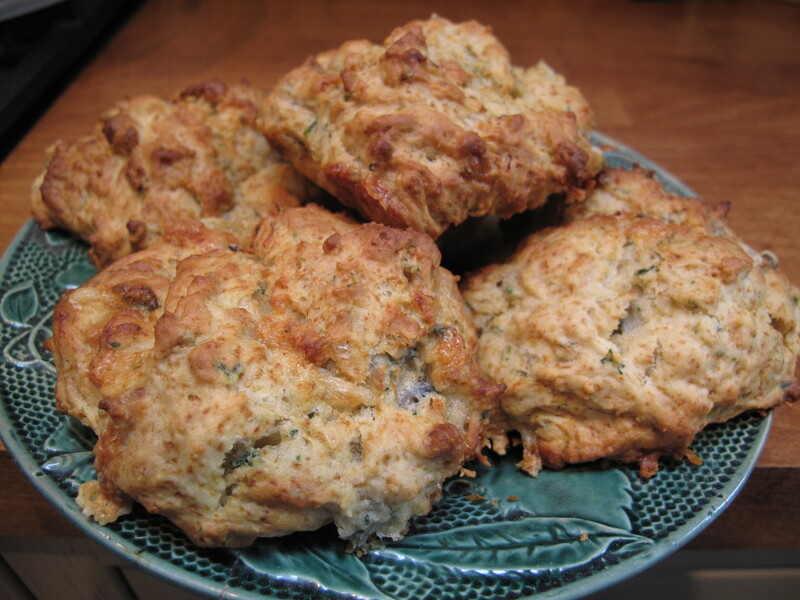 The scones would also work well with a different cheese or herbs such as chives or thyme. Heat the oven to 220˚C / 200˚C fan-assisted / Gas Mark 7. 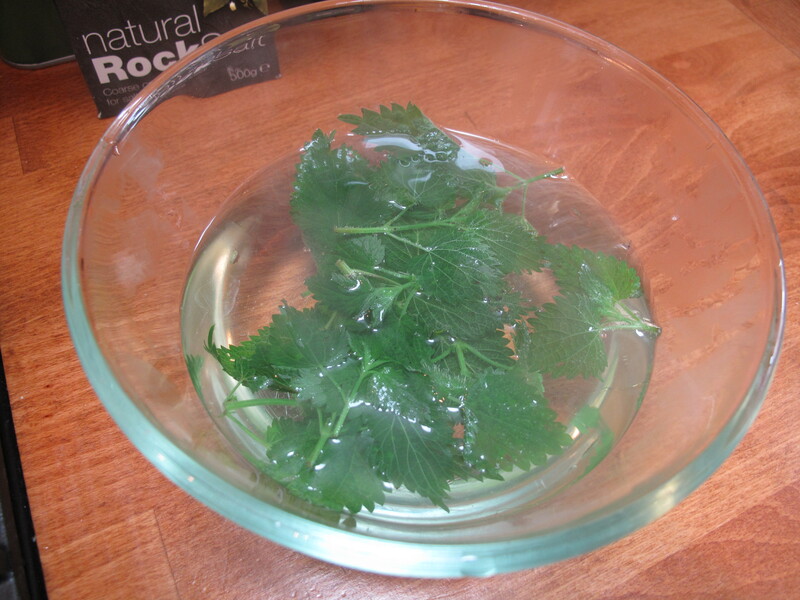 Wash the nettle tops thoroughly and then plunge them into boiling paper for a couple of minutes. This will neutralise the stings and, if you live anywhere similar to me, make sure that the last trace of dog wee has been eradicated. Chop finely. Mix together the flour, baking powder, bicarbonate of soda, sugar and salt. Rub in the butter with your fingers until the mixture resembles fine breadcrumbs. 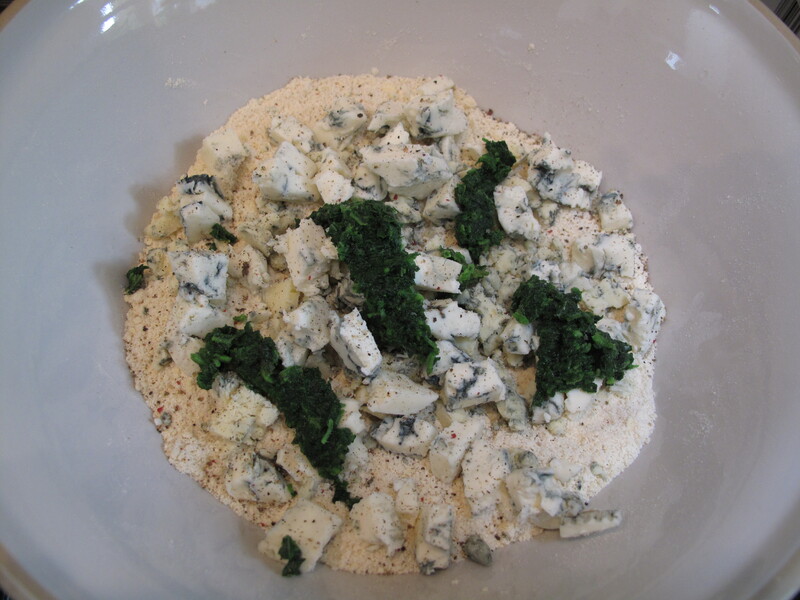 Chop the cheese into small pieces and mix into the flour mixture with the chopped nettles. Add a good grating of black pepper and stir in. Stir in the buttermilk to produce a slightly sticky dough. 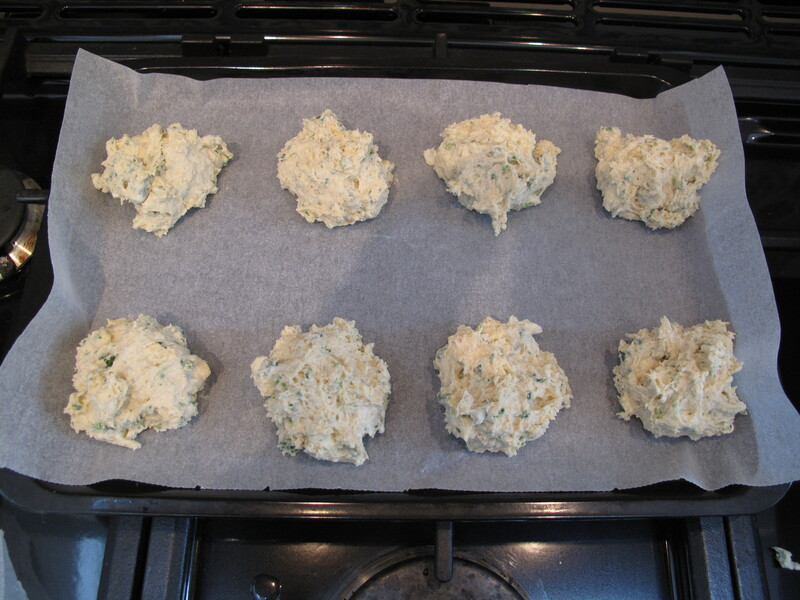 Line a baking tray with parchment paper and use a dessert spoon to drop dollops of the dough onto the paper. Bake for about 16-18 minutes until golden brown. Remove from the oven and cool. Best served on the same day. Because I foraged my nettles, I am entering this recipe in the Nature’s Lunchbox Challenge, hosted by Foodie Laura. Ooh yes, definitely a pasta sauce. I was very over-cautious with the nettles but hope to be braver in the future. It’s OK, they always advise to try a little at first. It’s really easy to get carried away, pick a ton of stuff and then find you don’t like them. The world of nettles is all new to me so didn’t realise there were different varieties. I think here in London we probably just have the ‘stingy and covered in dog wee’ genus but you never know. Have you done chocolate and nettles?! Thanks for sharing it 🙂 We used to have cheese scones quite a lot as a child (and sweet ones too!). About a month ago on the blog I posted Red Leicester and Sweet Potato scones which were also nice but not quite as fluffy. What a fantastic post. I’ve been reading a lot about nettles recently and I’d love to try them in my own cooking. I actually work in aged care, and I met a client recently who ate stinging nettles straight out of her back garden… raw, stings and all!! Ouch!!!! She swore by the health benefits though. I’d rather boil them first to save my tongue and cheeks, but each to their own! This recipe looks gorgeous. I feel exactly the same! Ugh, such a horrible thing to think about! I never realised you could become ‘desensitised’ to the nettle stings. Interesting! Nettle soup is delicious and freezes well too. Its wise to steer clear of the common when picking nettles, due to traffic fumes and dog urine. Local woods /paths a safer option. The soup sounds interesting. We are a bit short on woods/paths round here so I just try and go into the bushes a bit and then give it a thorough wash!